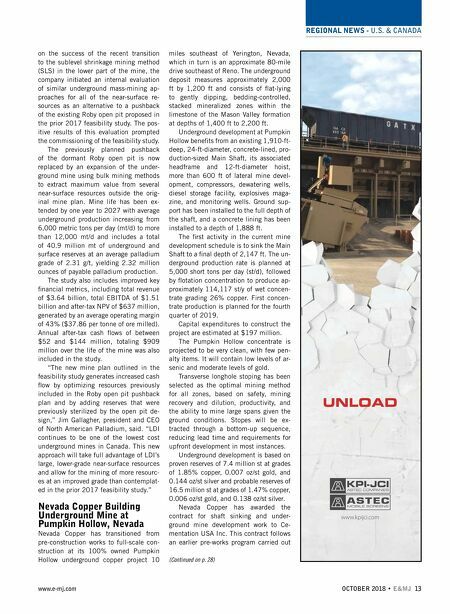 REGIONAL NEWS - U.S. & CANADA 12 E&MJ • OCTOBER 2018 www.e-mj.com cation to operate at 1,000 mt/d around year-end in the fourth quarter. During August, processing rates aver- aged approximately 450 mt/d, up from approximately 350 mt/d during July and approximately 250 mt/d during June. Pro- cessing rates regularly ranged between 500 mt/d to 650 mt/d during August and exceeded 800 mt/d late in the month. During the same time, plant availability improved to 80%, up from 75% in July and 65% in June. Through July, the company has invest- ed a total of $51.3 million in Silvertip, in- cluding $29.8 million of capitalized oper- ating expenses, $8 million of capitalized resource infill drilling and $2.1 million of expensed resource expansion drilling. In July, the company increased its full- year production guidance from 36 million to 39.4 million silver equivalent ounces to 37.3 million to 40.5 million silver equiva- lent ounces due to strong first half perfor- mance at its Palmarejo operation in Mexico. Barrick Gold Stabilizes Mine Waste at Cordero Mine Site The U.S. Environmental Protection Agen- cy (EPA) and the Bureau of Land Manage- ment (BLM) announced Barrick Gold U.S. Inc. has stabilized and secured an 11- acre pile of mercury waste tailings at the Cordero mercury mine, near McDermitt in Humboldt County, Nevada. The work cost approximately $1.3 million. "Securing the Cordero mine waste will protect surrounding lands and water- sheds," said EPA Pacific Southwest Re- gional Administrator Mike Stoker. "Bar- rick Gold worked cooperatively with EPA, BLM and the state of Nevada to ensure a timely and comprehensive solution." The Cordero mercury mine, most of which is located on federal land, is no lon- ger active, but had a large calcine pile that accumulated from historical operations. Calcine is the waste material from crushed mine ore that has been heated to remove mercury. Samples from the Cordero mine calcine pile and nearby soil showed ele- vated levels of arsenic and mercury. Bar- rick agreed to regrade and cover the pile to reduce risks to the surrounding environ- ment. Barrick Gold installed fencing and proper drainage to prevent runoff. 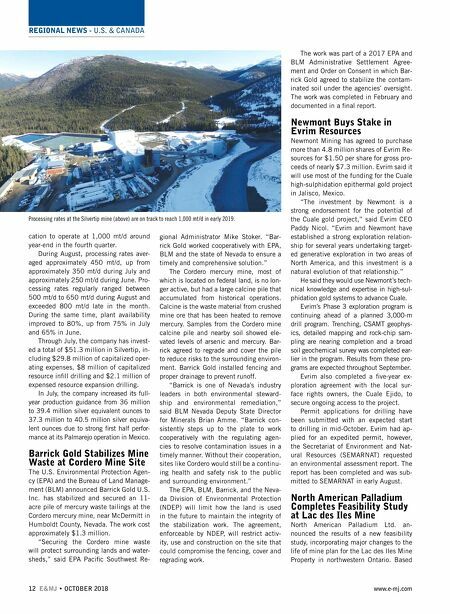 "Barrick is one of Nevada's industry leaders in both environmental steward- ship and environmental remediation," said BLM Nevada Deputy State Director for Minerals Brian Amme. "Barrick con- sistently steps up to the plate to work cooperatively with the regulating agen- cies to resolve contamination issues in a timely manner. Without their cooperation, sites like Cordero would still be a continu- ing health and safety risk to the public and surrounding environment." The EPA, BLM, Barrick, and the Neva- da Division of Environmental Protection (NDEP) will limit how the land is used in the future to maintain the integrity of the stabilization work. The agreement, enforceable by NDEP, will restrict activ- ity, use and construction on the site that could compromise the fencing, cover and regrading work. The work was part of a 2017 EPA and BLM Administrative Settlement Agree- ment and Order on Consent in which Bar- rick Gold agreed to stabilize the contam- inated soil under the agencies' oversight. The work was completed in February and documented in a final report. Newmont Buys Stake in Evrim Resources Newmont Mining has agreed to purchase more than 4.8 million shares of Evrim Re- sources for $1.50 per share for gross pro- ceeds of nearly $7.3 million. Evrim said it will use most of the funding for the Cuale high-sulphidation epithermal gold project in Jalisco, Mexico. "The investment by Newmont is a strong endorsement for the potential of the Cuale gold project," said Evrim CEO Paddy Nicol. "Evrim and Newmont have established a strong exploration relation- ship for several years undertaking target- ed generative exploration in two areas of North America, and this investment is a natural evolution of that relationship." He said they would use Newmont's tech- nical knowledge and expertise in high-sul- phidation gold systems to advance Cuale. Evrim's Phase 3 exploration program is continuing ahead of a planned 3,000-m drill program. Trenching, CSAMT geophys- ics, detailed mapping and rock-chip sam- pling are nearing completion and a broad soil geochemical survey was completed ear- lier in the program. Results from these pro- grams are expected throughout September. Evrim also completed a five-year ex- ploration agreement with the local sur- face rights owners, the Cuale Ejido, to secure ongoing access to the project. Permit applications for drilling have been submitted with an expected start to drilling in mid-October. Evrim had ap- plied for an expedited permit, however, the Secretariat of Environment and Nat- ural Resources (SEMARNAT) requested an environmental assessment report. The report has been completed and was sub- mitted to SEMARNAT in early August. North American Palladium Completes Feasibility Study at Lac des Iles Mine North American Palladium Ltd. an- nounced the results of a new feasibility study, incorporating major changes to the life of mine plan for the Lac des Iles Mine Property in northwestern Ontario. Based Processing rates at the Silvertip mine (above) are on track to reach 1,000 mt/d in early 2019.